Are you waiting for your turn to see Lin-Manuel Miranda’s masterpiece, Hamilton: An American Musical, the hottest show on Broadway? Go ahead and pick up Miranda’s “mix tape” that he just released, which has all of Twitter abuzz, but also don’t miss your shot to visit these places that are all about the life of George Washington’s right hand man. Hamilton Grange National Memorial: Located in New York City’s Saint Nicholas Park, this was Alexander Hamilton’s Harlem country home. This founding father was born in the Caribbean island of Nevis as an orphan but then came to the United States to New York in 1772 at age 17. Here you can see re-creations of the mansion’s interior rooms and there’s an interactive exhibit. Museum of American Finance: While you’re in the Big Apple, head down to Wall Street and visit the Museum of American Finance where you can stand in the Hamilton Room. Hamilton founded the Bank of New York, and the room is also dedicated to the Walton House, which served as the bank president's office. You can see what Hamilton published as well as documents that Hamilton actually signed and more. While you’re there, see where Hamilton is buried at the nearby Trinity Church cemetery. 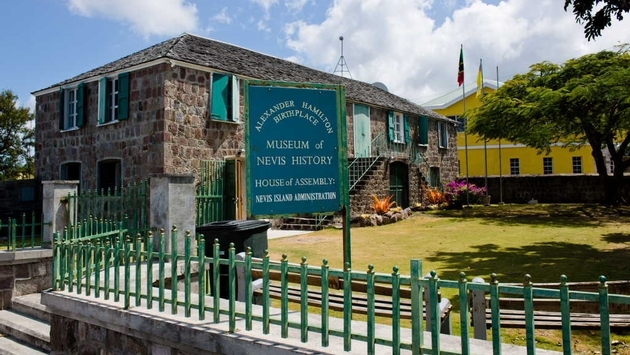 Alexander Hamilton House: When Hamilton was young and scrappy, he spent his childhood and teenage years in Nevis in the West Indies, which is now a Museum. If you’re already vacationing in the area, stop and visit this small, but worthy, exhibit. Schuyler Mansion: You want a revolution? I want a revelation. Here’s a revelation – there’s a Schuyler Mansion about an hour north of New York City, in Albany, New York. The Schuyler Mansion was home to Philip J. Schuyler and his wife, Catharine Van Rensselaer. The couple lived here and raised eight children. One of the daughters, Elizabeth, ultimately married Alexander in 1780. Alexander Hamilton U.S. Customs Service: Now located on Bowling Green in Manhattan, the site of the city's first Custom House burned down in 1814. In 1888, the customs service moved several times until it found its Bowling Green site in 1892. The building was listed in the National Register of Historic Places in 1972 and was designated a National Historic Landmark in 1976. The inside of the home is absolutely beautiful with the two-story Great Hall, marble finishes, curved staircases and other decorative touches. New Jersey: Head down to Weehawken, New Jersey and stand where Aaron Burr shot and killed Alexander Hamilton. In 1801, Hamilton’s son Philip died here in a duel too. In Paterson, New Jersey, Hamilton co-founded the Society for Establishing Useful Manufactures (S.U.M. ), which in 1792, purchased 700 acres of land above and below the Great Falls and established the city of Paterson. There are many Alexander Hamilton souvenirs to buy and there’s a statue of Alexander Hamilton outside. Speaking of statues, in Washington, D.C. there’s also a statue of Alexander Hamilton outside of the Treasury Building and his Federalist Papers are located at the Library of Congress. From now through Dec. 31, the New York Public Library is hosting an exhibit, Alexander Hamilton: Striver, Statesman, Scoundrel. Here you can see artifacts from the life of the founding father and the beginning years of the United States.